The theater, whose construction was begun by Julius Caesar and completed by Augustus in 11 B.C. was dedicated to Augustus’s nephew Marcellus, who had died young. The building is 32.6 meters (107 feet) high and is faced in travertine. The outer wall has 41 arches and its architecture is divided into three orders: Doric at the bottom, Ionian in the middle and Corinthian at the top. The radial walls were built with rectangular blocks of tufa, the inner corridors were made of brick and the vaults of concrete. The auditorium (cavea), 130 meters (142 yards) in diameter, could seat 15,000. In the fourth century A.D., the theater was no longer in use. In medieval times it was occupied by the Savelli family, and in the eighteenth century it was sold to the Orsini family. The Orsini built themselves a palace atop the ancient theater, designed by the architect Baldassarre Peruzzi, and they still live there. Between 1926 and 1932, the structures that had arisen around the theater over the centuries were demolished. 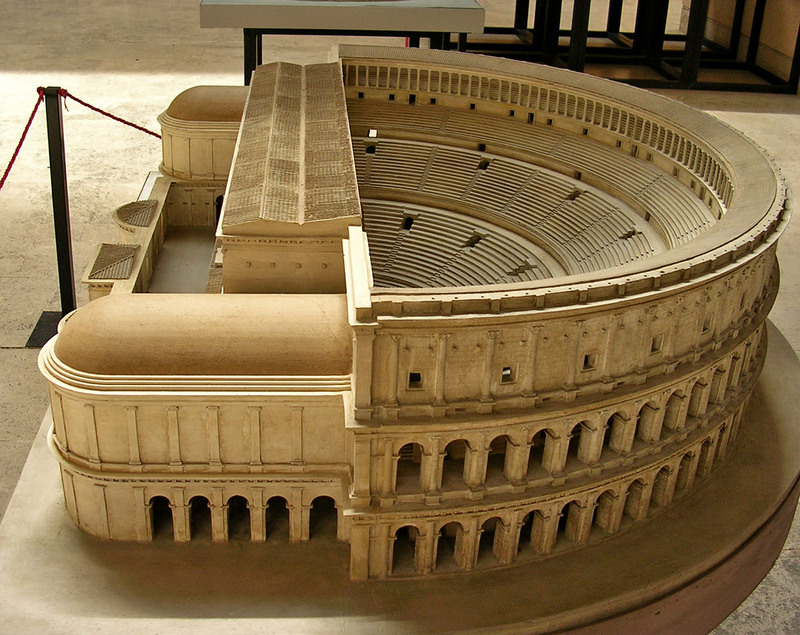 Ancient Rome had two other theaters — Pompey’s, with 27,000 seats, and Balbus’s, with 7700 — making a total capacity of 50,000. The theater season ran from April to November. The shows that the Romans loved best were pantomimes, whose plots were based on daily life. The audience’s preferences went to grotesque subjects and — still more — scenes of bloodshed.